With more than 20 ships operating Douro River Cruises, your choices are abundant. Why choose Emerald Waterways? After spending eight days on the new Emerald Radiance during November, I identified six ways that the company differentiates itself from its competitors on the Douro. 1. Emerald Radiance is among the newest ships on the Douro. Built in 2017, Emerald Radiance features a contemporary, boutique hotel design, with a top-deck pool/hot tub, lower deck gym (with elliptical trainer and treadmill) and spa (for massages and salon services). Walking onto the ship reminded me of striding into a classy hotel lobby, with trendy light fixtures over the center stairwell and two new iMacs at the reception desk. A backlit electronic display rotated images of the Douro and showed the day’s activities. On deck two was the open-seating Reflections Restaurant, capable of seating all 112 guests at once, and up one deck, the Horizon Lounge, with a bar and comfortable seating as well as access to an open area with seating up front. Light breakfasts and lunches were served daily in the Horizon Lounge as options to dining in the main restaurant. On the lower deck, we made use of the pool, gym and spa during our eight days on board: the pool for cooling off on one warm day on the Douro, the gym for about 25 minutes on two occasions, and the spa for a haircut and massage. The entire ship is modern and well-equipped for enjoying the Douro, with plenty of outdoor space on the top deck, which featured comfortable seating, awnings to provide shade and an outdoor grill area for barbecue lunches typically offered once per sailing. 2. Emerald Waterways runs its own operations on the Douro. 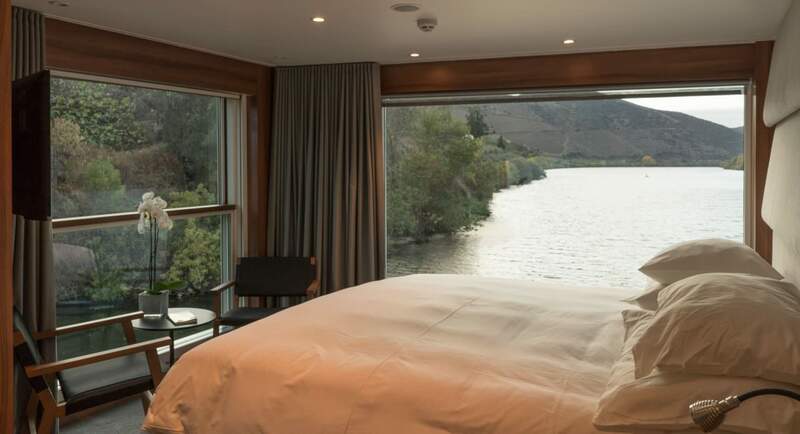 Many of the river cruise companies that offer Douro River Cruises essentially charter their ships and their operations through Douro Azul, a Portuguese company. Emerald Waterways broke with the status quo, however, to run its own show. Emerald (and its sister company Scenic) built their own ships, constructed their own dock, and hired and trained their own crews. Does Emerald’s “owning” its operation make any difference? The first notable difference comes when boarding the ship. Emerald Radiance docks just steps away from the famed Ribiera, with its colorful cafes and shops along the waterfront. Think Barcelona’s Las Ramblas, but on a smaller scale. Most of the competing river cruise ships dock across the river in Gaia. Docking at Miragaia (which translates roughly into “View of Gaia”) comes as a bonus. On the sunny Saturday that we boarded Emerald Radiance, for example, we unpacked, then walked off the ship to a local restaurant along the Ribiera, where we found a table overlooking the Douro for grilled sardines, calamari, bread and olives, and Portuguese wine (and a remarkably reasonable price tag, just a tad more than €30 for the four of us). It was good to be within walking distance of the action along the waterfront. Even more important than the docking location perhaps is that fact that Emerald Radiance’s staff are employees of Emerald Waterways. Instead of contracting its employees from another company, Emerald hired its own crew, most of whom had previous experience working on Douro river ships. I found the staff (nearly all of them Portuguese) to be not only professional but also warm, friendly and hospitable. They seemed to be genuinely happy to be of service. Perhaps that should come as no surprise. 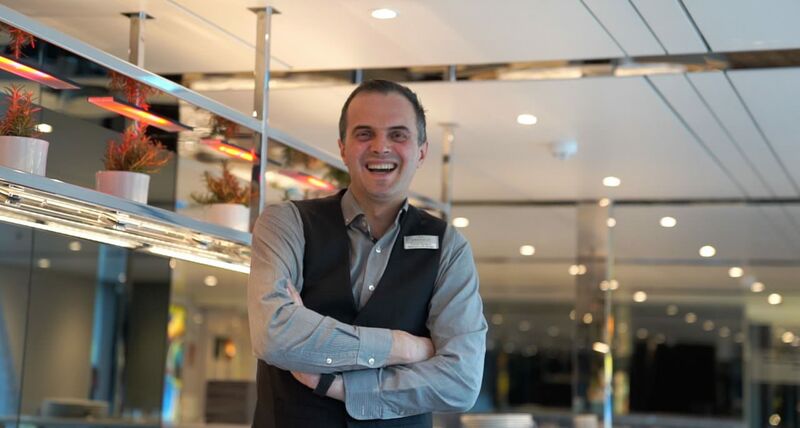 As Emerald Radiance’s Hotel Manager Bruno Pinheiro told me during dinner one evening: “I have one philosophy: Happy crew, happy guests.” Indeed that was what we experienced during our eight days on Emerald Radiance. 3. Emerald Radiance features a wide selection of staterooms and suites. Accommodations range from 153-square-foot staterooms on the lower (Riviera) deck to a pair of 300-square-foot Riverview Suites, situated aft on the top (Horizon) deck. In between are two, 285-square-foot one-bedroom Owner’s Suites and a slew of Panorama Balcony Suites ranging from 160 square feet to 188 square feet. All except the staterooms on the lower deck feature floor-to-ceiling windows that open with the push of a button, and with shades and screens that can filter sun and insects. I like Emerald’s “balcony” concept. Although it was not a balcony that you step out onto, the electronic window achieved the same result. It put my face in the open air of the Douro (and was also great for photography without leaving the room). All staterooms also featured stocked minibars (items were complimentary for Riverview and Owner’s suites), bottled water, flat-screen televisions with new-release movies and more than 20 network channels, bathrobes, slippers, trekking poles, safe, hair dryer and much more. The four larger suites, Owners and Riverview, also came with room service for breakfast and daily fruits, afternoon canapés and sweets. The complimentary mini-bar could also be personalized from the standard setup of Portuguese wines, Portuguese beer, soft drinks, juices, spirits as well as Pringles and tea biscuits. 4. Exceptional food and wine. With its floor-to-ceiling windows on each side, the Reflections Restaurant featured a range of dining styles, from sumptuous buffet breakfasts and lunches to fine-dining during the full-course dinners. The dining experience, in fact, was a mark above anything I’ve experienced on the Douro. I enjoyed classics such as grilled salmon, steak and chicken, as well as traditional Portuguese dishes such as chorizo, Francesinha (a gravy-laden sandwich that originated in Porto), grilled sardines and the delicious custard known as Pastel Nata. The vegetarian dishes, which I tried on a couple of nights, were also delicious. Sorbets were made fresh on the ship. I particularly enjoyed a scoop of mango sorbet that accompanied a generous dollop of the ever-so-decadent Bread and Butter Pudding. I also appreciated the open-seating dining, where we could show up for dinner anytime between 7 p.m. and 9 pm. No rigid dining times here. The wines, in particular, were noteworthy, red and whites all from Portugal and served along with beer and soft drinks at no charge during lunch and dinner. Beverage packages also were available for those who desired more: Emerald Extended, which included the daily selection of wines, draft beer and soft drinks throughout the day for €9.90 per person per day; Emerald Premium, which included the entire beverage menu for €19.90 per person per day; Beer Package, €18 for six bottled beers; and the Champagne Package, €140 for three bottles of Möet & Chandon. 5. Gratuities are included. The staff on Emerald Radiance are so friendly and so good at their jobs that we left a little something for them at the end of our cruise. But as gratuities are included you can feel good about stepping off the ship even if you do not tip extra. Gratuities are also included for tour guides and motorcoach drivers, so you need not think about dipping into your pocket at the conclusion of your tours. 6. Exceptional coffee and tea. It may not seem like a big deal, but if you’re cruising the Douro for eight days, you’ll no doubt want a cup of coffee or a cuppa tea that you thoroughly enjoy. Emerald Radiance features one of the best coffee machines that I’ve ever encountered (though I have encountered them before on sister company Scenic). I’m told the self-service machine costs more than €10,000. I can believe it. I took to calling the machine RoboCoffee. Take my favorite Latte Macchiato, for example. 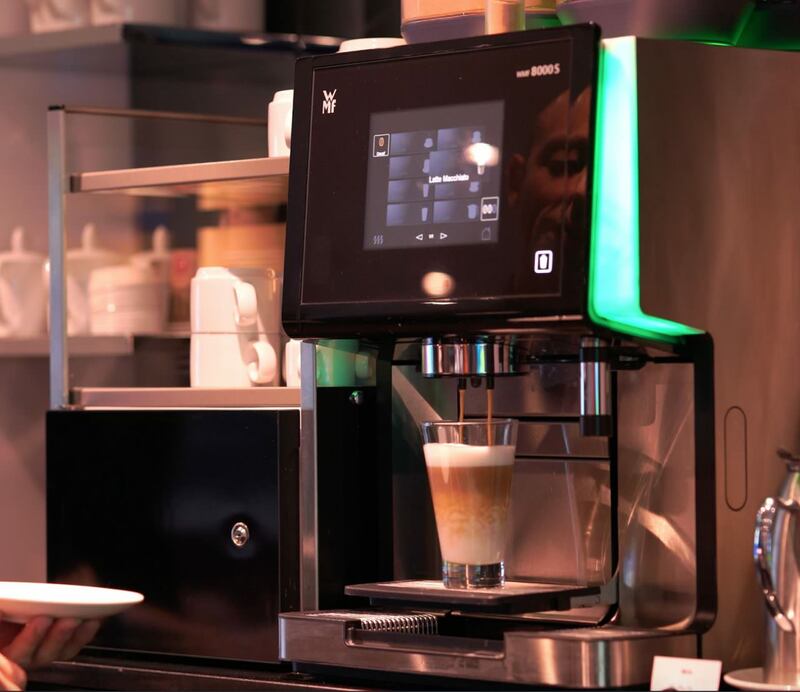 With the push of a button, the coffee machine huffs out a puff of steam, dispenses frothy milk, then a short shot of espresso. The result is beautiful, delicious and highly caffeinated, the perfect potion for a new day on the Douro. 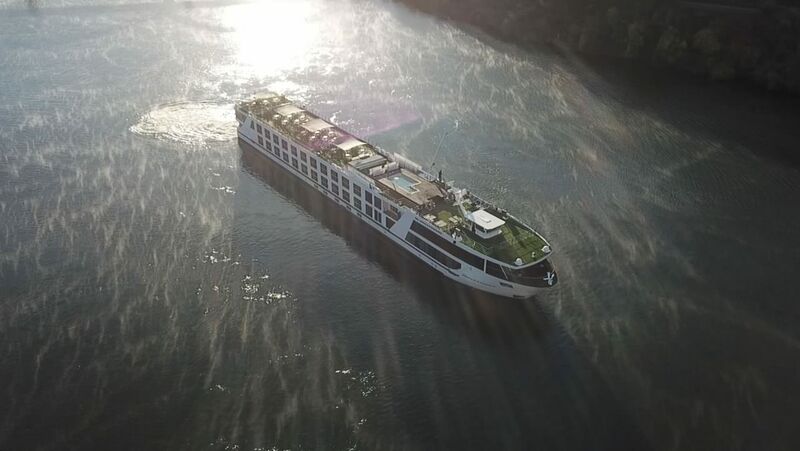 Emerald Radiance only began Douro River Cruises this past spring. And although ours was the last sailing of the season, in all aspects, the product appeared to be spot on, from accommodations to service to dining and activities. That’s not just my opinion, but also the opinion of others who I spoke with at the end of our cruise. Of course, there will always be quibbles. Some who I spoke with wished for bigger bathrooms; others expressed desires for activities beyond the gym. Staterooms on river cruisers are smaller than hotel rooms that travelers may be accustomed to (and hence bathrooms too). As for activity, our group of four set out on a rigorous hike in Barca d’Alva, climbing (and scrambling at times) more than 1,000 feet. The climb rewarded us with gorgeous sun-splashed views over the Douro River meandering its way into Spain. The trek up and back took us more than three hours, past prickly pear cacti, dried lavender and sturdy olive trees, and through vineyards where we plucked last-of-the-season grapes that were still sweet to the taste. The activity left us feeling good about being out and in the open in such beautiful surroundings. Next year, Emerald Radiance will add canoe excursions and yoga sessions – and no doubt the return of its wonderful crew – and perhaps many more North Americans. 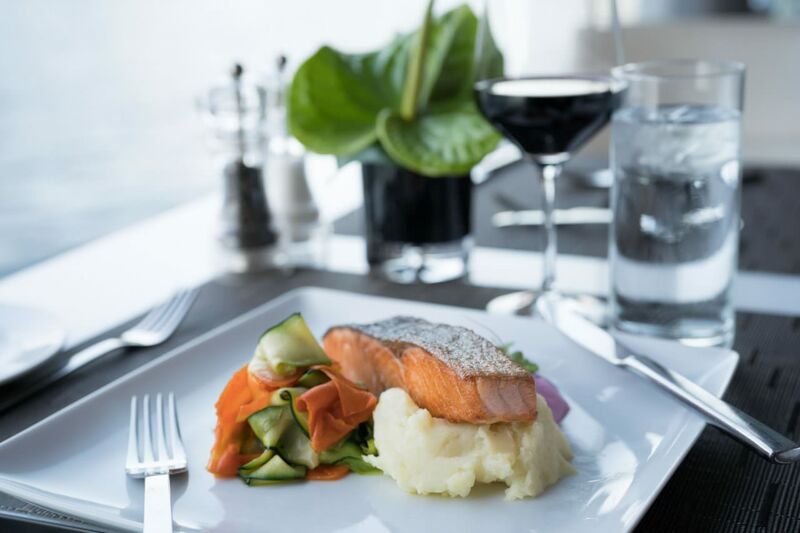 Emerald Waterways is already well-known among Australians and Brits, and those two nationalities, along with Kiwis, typically make up the majority of guests on board. As the company increases its marketing presence in North America, however, Americans and Canadians are discovering Emerald Waterways. On our sailing, we met more than a dozen guests from the United States and Canada. We considered it to be a bonus to meet people from all over the world. The cultural nuances and senses of humor made interaction with other guests pleasant and harmonious. At least twice during our cruise, everyone on the ship danced, once during an evening round of music trivia and another time on the next to the last night when the crew pulled us out of our chairs and into a conga line. There also were many moments of serenity. As Emerald Radiance sailed under cotton-candy-pink skies, we enjoyed a few evenings out on deck talking with a retired Episcopal cleric and his wife about books that we’d read and about past and future travels. We’d met Dan and Elizabeth on the first evening of our cruise as we sailed through Porto, all illuminated and beautiful under a full moon. It was a lovely beginning to the wonderful week ahead. One of the highlights of our cruise was an included dinner at Quinta da Pacheca, a centuries-old vineyard in Lamego. Our motorcoach turned down a sycamore-lined lane and stopped in front of an expansive wine cellar where we stepped inside and onto dirt floors flanked on each side by huge barrels of wine. The setting was beautiful, and our table of eight enjoyed both the food and wine. While we were dining, a musical trio playing traditional Portuguese music strolled around to the various tables. It was an enjoyable and memorable night. Our cruise took us 130 miles up the Douro, along a river walled in by wide expanses of forests, clusters of boulders, charming villages and sprawling quintas (wine estates). The beauty of the river certainly was the star of the show. A Douro river cruise is perfect for those who appreciate the beauty of nature, the enduring taste of a fine wine and the warmth of the Portuguese people. Emerald Radiance complements the river by showcasing it in a style that is comfortable and distinct. 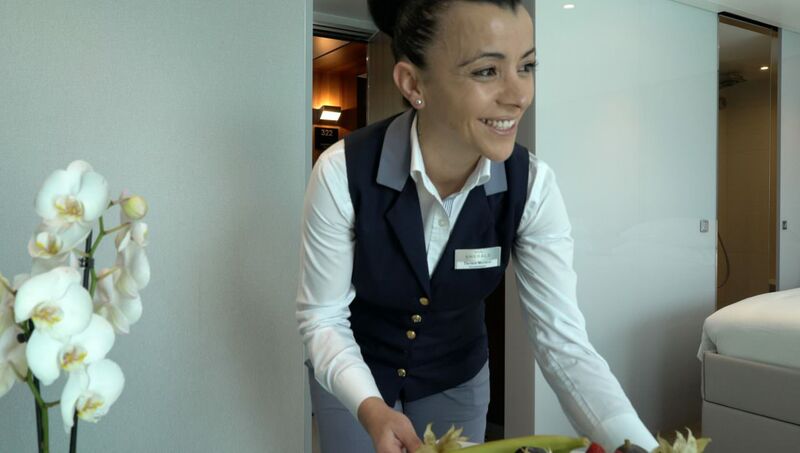 On the last day of our cruise, Carla, who looked after us on our tours, said to our group: “I am really sad to see you all go.” And though I am sure she had said that at the end of every cruise this season, there was no doubt that she was sincere. She confessed to being a bit emotional in nature. I would characterize it as warmth and caring. If there were a symbol that represents the Portuguese people, to me that symbol would be a heart. Our time on Emerald Radiance left us with impressions of a place that will forever endure in our minds, and with memories of people, both guests and crew, who we will not soon forget. We have done two river cruises in Europe, August 2016 on the Rhine with Viking, then last fall the Danube with Scenic. The Viking cruise was perfect. We loved every minute of it. Last Sept we got caught in the low water levels fiasco and were disappointed with the uncertainty, delays, having to bus and hotel, etc. Scenic did provide a cash compensation package for the disruption which in hindsight does look reasonable as compared to some of the comments from other cruisers. We are looking at a Douro River Cruise with Viking in 2020. In your review of Douro with Emerald in 2017 you state that Emerald gets the best berths. Is this still the case? Were there water level problems on the Duoro in 2018? Viking is launching a new ship for the Douro. Any comparison to Emerald’s vessels In terms of number of passengers, amenities, etc? Tim, Emerald gets good berths in Porto. The berth will be the best for some, because of its proximity to the riverside cafes, and for others, across the river will be better. Water levels in 2018 were not a problem that I know of. The fire in Portugal, that was widely reported, was an issue. I don’t know much about Viking’s new ship on the Douro yet. Hope this helps.